Winter brings moments of joy. It brings the happiness of festivals for everyone. And, for technology lovers, it brings the happiness associated with the release of new things that the biggest and the most popular CRM in the technology world will bring for them – Salesforce! 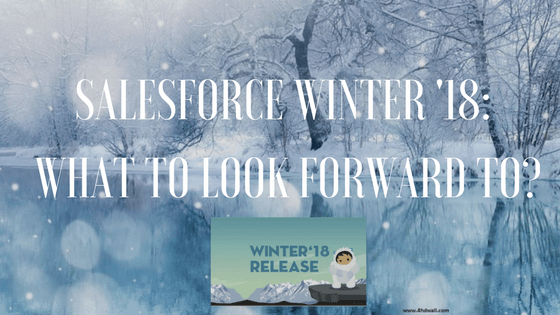 Salesforce 2018 Notes are out and they have created quite a stir since their release owing to the long list of changes that the CRM giant has promised to introduce in the next edition of Salesforce. First things first – Salesforce 2018 is going to get a new look and feel, with some great UI changes. These changes will include less scrolling, more information density, and less empty white space. What this new look will sport is an enhanced use of font and color options to draw user attention towards the most important information on the screen. Users will now also get the option to select a background and color for the CRM, which is inspired by Trailhead. The company has also given hints that in future they might also introduce the option to create a customized theme to match individual company branding as well. Another great feature that you will notice in Salesforce 2018 is the option to update multiple records without leaving the list view. The best part is that you can edit up to 200 records at one time. All you have to do is click on the edit icon present next to the field you want to update, enter the new value and click update. The select records are going to be updated automatically – all at once! One of the most anticipated changes in the CRM is related to search queries. Salesforce has introduced spell correction in search to get relevant results even when you have misspelled the search term. For instance – if you don’t get any search results for the term you have typed as a result of a spelling error, the CRM will automatically show suggestions that might match the original term you were searching for. This is going to make search experience much better than it used to be in any of the counterparts. Another exciting addition that the software giant has promised to bring is the option to add multiple team members to an opportunity on one page. What this means is that you don’t have to add opportunity one by one for individual team members. You can simply create one page and add multiple team members to an opportunity – making the entire process quick, easy and hassle-free! Another powerful feature that the new CRM is going to include is the all-new Macros Builder point-and-click interface. With the all-new macros, you can edit and add instructions to the already existing one using an enhanced visual experience, which is somewhat closer to the Lightning App Builder. With the all-new macros, the users also get the option to capture quick actions as well as fields that they want to incorporate in the instructions for macros. The last thing that we have on this list for you is the completely revamped Live Agent. With a larger chat window and a completely redesigned look and feel, the users are going to love the experience of using Live Agent. That’s not all. There are plenty of other small additions that are going to surprise you, but this surprise is definitely going to be a pleasant one. You can check out the complete notes at the company official notes page. Need help with Salesforce integration, development and support? Get in touch with Salesforce experts by dropping us an email at sales@signitysolutions.com. And, we will get back to you with all the help and support you need.